Trail Condition: The trail system is closed for the season. 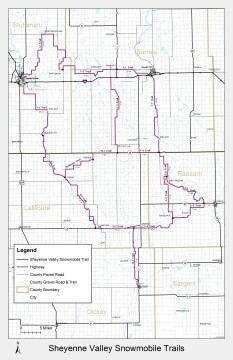 The Sheyenne Valley Trail is located south of Jamestown and Valley City. There is a wide variety of riding in this system. The trail follows the Sheyenne River bottom and the James River. It also has ditch riding, shelter belts, and wide open fields. This takes you through the Fort Ransom State Park and also a park called Little Yellowstone. Several other stops are located along the way for you to warm up or relax as you enjoy riding this very attractive trail system.